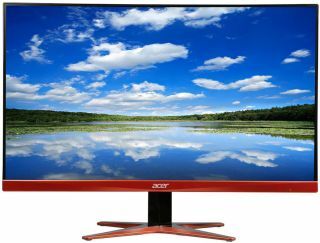 Acer's XG270HU was the first monitor we tested that brought support for AMD's FreeSync technology. That was back in 2015, and our main gripe was that it felt overpriced at $500. Well, it took some time, but the 27-inch monitor can now be had for $370 at Newegg. That's a sale price that runs through today. Had it been priced as such to begin with, it likely would have scored higher than a 70 in our evaluation. It's a decent enough monitor overall with a 2560x1440 resolution, 144Hz refresh rate, and low 1ms response time. Other features include a pair of built-in 2W speakers, 350 nits brightness (that's about average), and connectivity that consists of an HDMI port, a DisplayPort, and two DVI ports. Assuming the panel is the same as it was in 2015 (the specs are the same), it's a 6-bit TN screen that uses Frame Rate Control (FRC) and not a true 8-bit panel. There are definitely high quality monitors out there, though at the sale price, it's a lot more palatable. And in our experience with this particular model, it's ready to run out the box without fiddling with any of the settings. Check out our full review for more information. Then if you're interested, go here to grab it on sale at Newegg.